By this time next week, my baby boy will be 1 year old. I can hardly believe it and I’ve definitely been feeling mixed emotions about it. His birthday party is the weekend after his birthday, so I’ve been distracting myself with prep for that. 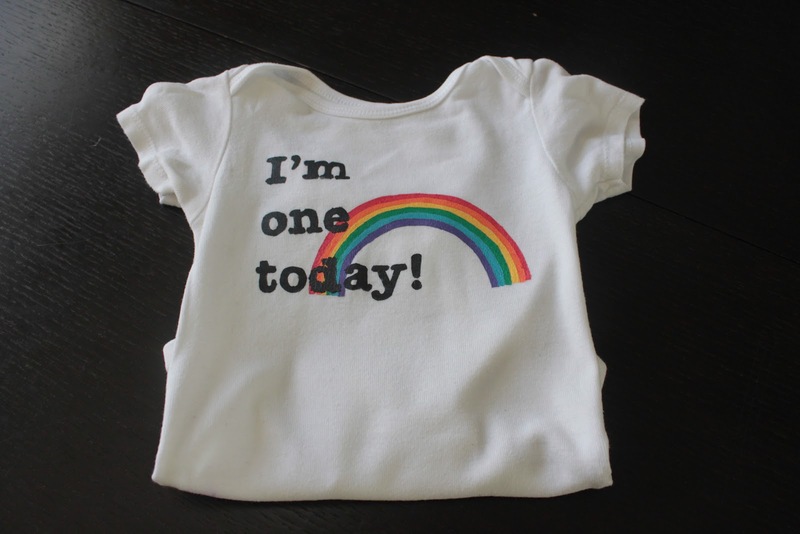 We’re planning a rainbow theme for his party, and I have lots of ideas spinning around in my head (and on my pinterest boards). I’m sure I’ll post more about decor as things get finished and after the party itself. For now, though, let’s talk 1st birthday outfit. 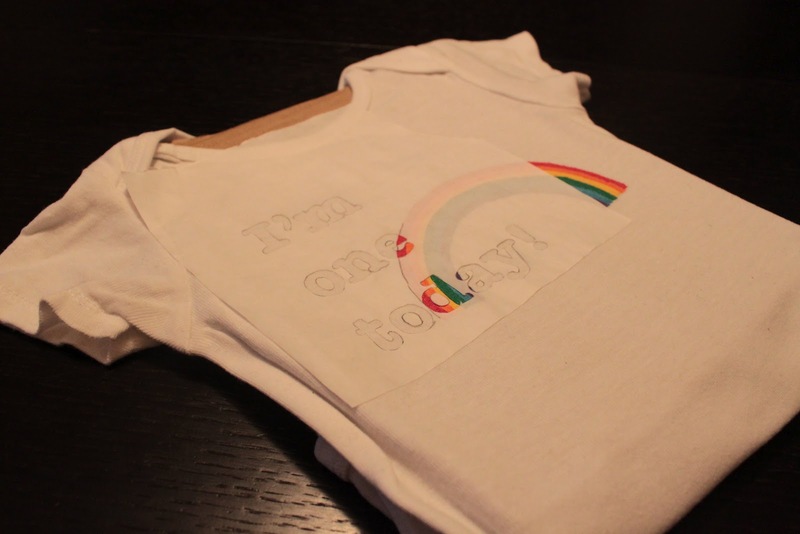 I decided to make him a rainbow onesie for the occasion, using freezer paper stenciling. 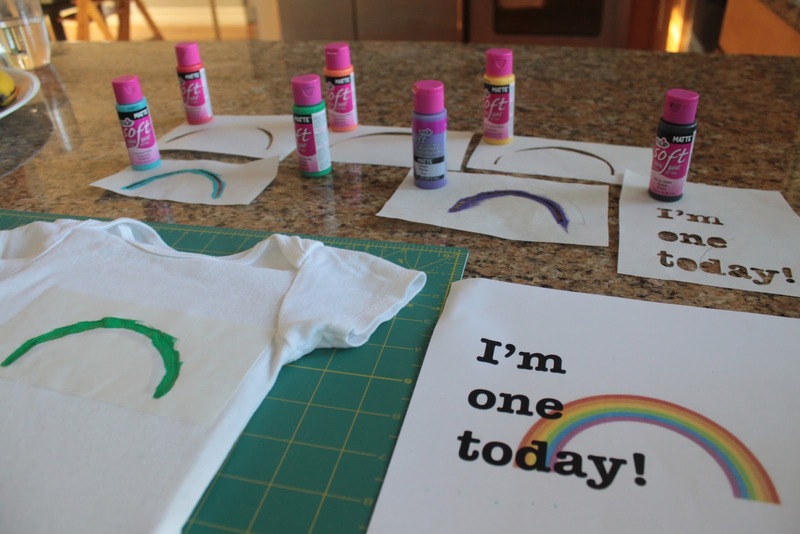 I knew that making a rainbow using freezer paper stenciling would involve many layers, and therefore, a lot of time, but I wanted to give it a shot. It ended up turning out well, except for where part of the writing went over the rainbow and bled a bit. I’m learning that freezer paper does not stick as well to paint as it does to fabric. 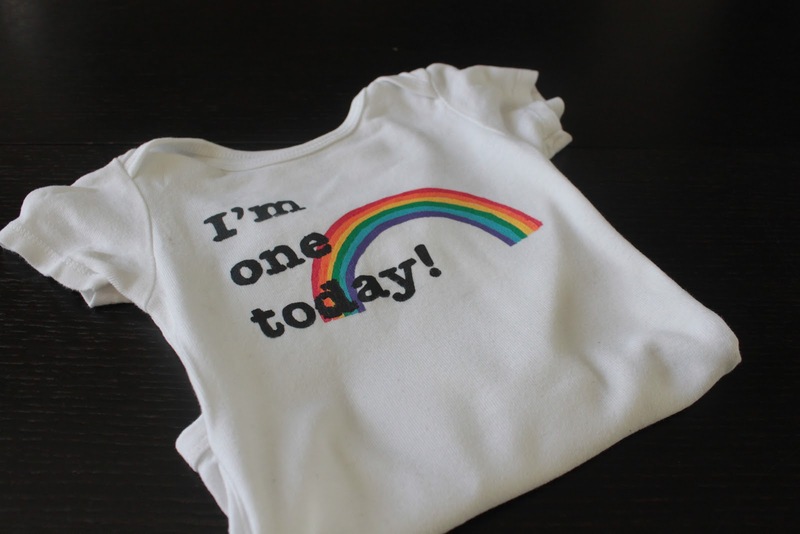 Below, I’ll post some pictures of the process for this onesie. 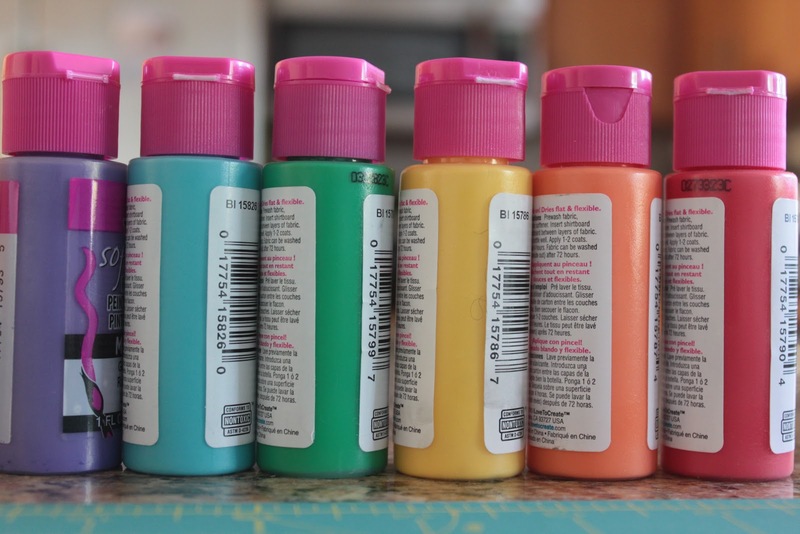 If you want a more in depth tutorial, though, take a look at this post on freezer paper stenciling. Almost done. Just need to paint the text on there. It took about a week to do it all (a day for each color), but I think it turned out very cute! 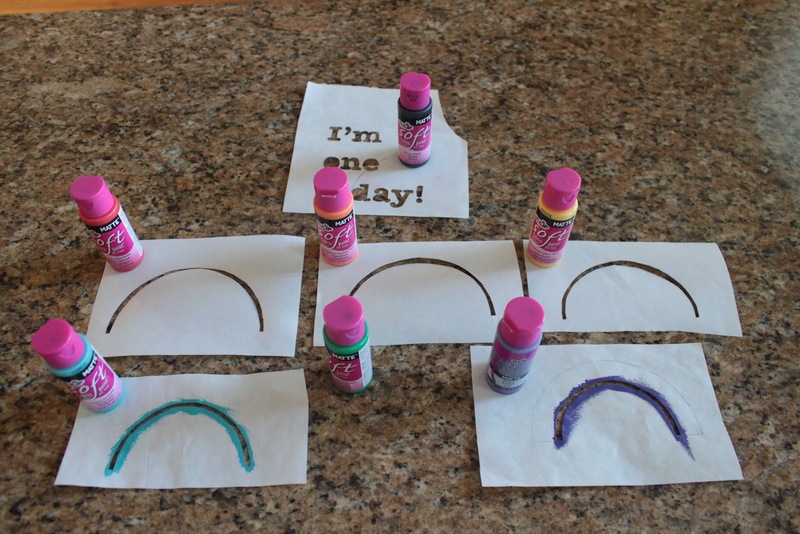 If I have some extra time and patience, I’ll touch up the blotchy “d” on the rainbow, but I’ll probably leave it as is. I have too many projects to finish before the big day and too little time! This entry was posted in DIY project on June 20, 2012 by seedsowingmama. We’re back from France. It was quite a trip. As you can probably tell from recent blog posts, it was full of relaxing, taking walks in beautiful places, and eating delicious food. A recipe for a wonderful vacation, indeed. Now that we’re home (and both of our computers are back from the “doctor!” Yay! ), I’m back in business. Blogging business, that is. It’s tough to write blog posts from an iPad, especially if I want to include pictures, which I basically always do. Anyway, my lack of posting recently does not mean that I haven’t been working on lots of fun projects! 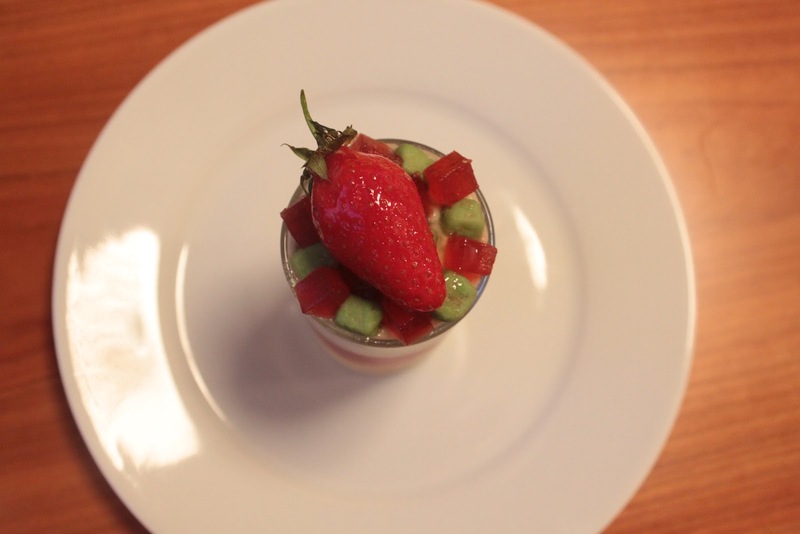 Some things to look for on Fraises et Tartines soon include, re-painting a thrift store mirror, tissue paper pom poms, more freezer paper stenciling, and probably one or two more posts about France. First, though, I want to wish all the dads out there a very happy Father’s Day! Thank you to my dad for being the smartest guy I know and teaching me that learning doesn’t end after you finish school. My dad is definitely where I get my thirst for figuring out how to make things myself (even if he is interested in things like computers, batteries and lights, and I am more interested in things like soap, vinegar and macarons). And let’s not forget a newer dad in my life, my sweet husband, Trevor! Thank you for always caring for Quentin and me. You are helpful, patient, and most importantly, you can make Quentin laugh the harder than anyone else can. I love you and look forward to going through each stage of our little boy’s life together. For Trevor’s first Father’s Day, I wanted to do something special, but budget-friendly. 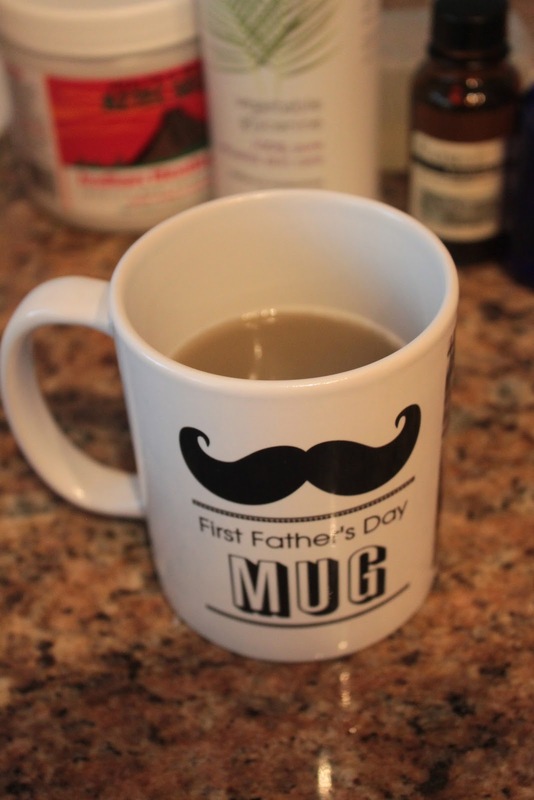 I had the idea a while back of having a photo mug made for Trevor and filling it with shaving soap. He shaves with old school shaving soap, a badger hair brush, and a straight blade safety razor (like this one). I’ve made all of his shaving soap for the last few years, and it has worked out great! We save loads of money on razors and shaving cream, and he finally gets the close shave he’s been looking for. Win win! Hopefully I can have him write a guest post about it soon, but for now, that’s the gist. Anyway, I decided Father’s Day was a good occasion for this particular gift idea. 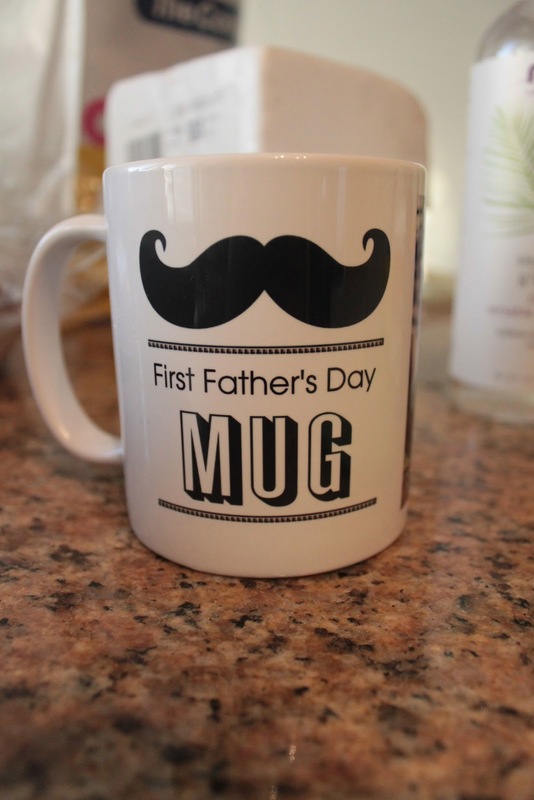 So, I browsed through the mug templates available on shutterfly.com and found one with a mustache, which totally sealed the deal. I ordered the mug while we were still in Paris, and it arrived the day Trevor left for a business trip. Perfect! While he was out of town, I assembled my supplies: 1 lb block of melt and pour shave soap from www.brambleberry.com, vegetable glycerin, bentonite clay, essential oils, rubbing alcohol in a small sprayer, a sharp knife, a pyrex bowl, a small bowl, a spatula, some plastic wrap, and of course, the mug! For this batch of soap, I used 1/2 lb of melt and pour shaving soap, 1 tsp of bentonite clay, a big enough squirt of vegetable glycerin to make a paste with the clay, and 2 tsp of essential oil (the EO I used is called “Rain,” also purchased from www.brambleberry.com). 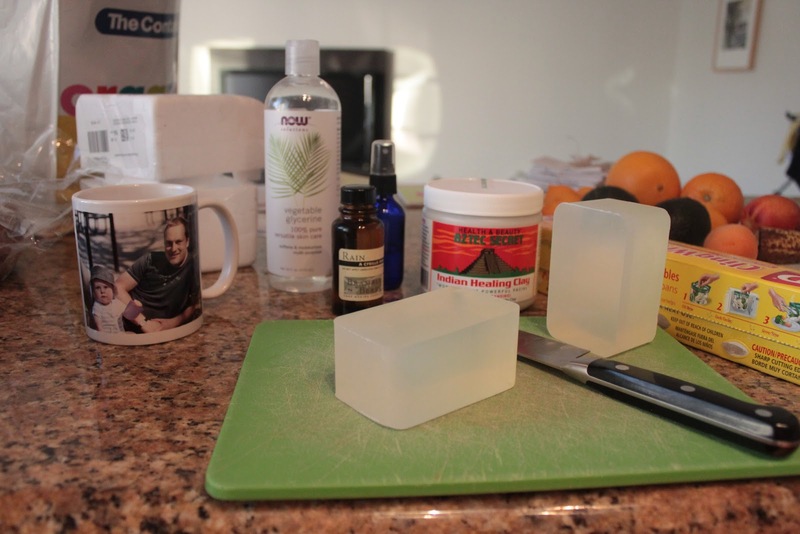 Here’s my process for making melt and pour shaving soap: First, cut the soap into cubes. Place it in your microwave-safe bowl, cover with plastic wrap, and microwave in 30 second increments until completely melted. Mix with a spatula after each heating. With only a 1/2 lb of soap, it only took 1 minute total to melt the soap down completely. In a small bowl, mix the bentonite clay with a squirt of vegetable glycerin to make a paste. Mix into melted soap, along with the essential oils. Wait a few minutes for the soap to cool down before pouring it into your mug. Otherwise, the clay will settle to the bottom. Just before pouring the soap, give it one last stir to distribute the clay. Use a funnel to pour the soap into the mug. Spray with rubbing alcohol to get rid of bubbles. Allow the soap to cool completely, undisturbed, for at least 2 hours. Once cooled, cover the whole thing with plastic wrap until it’s ready to be used. Once again, happy Father’s Day to all the dads out there! Hope everyone is having a lovely day. This entry was posted in DIY project, gift on June 17, 2012 by seedsowingmama. Trevor left to go back home on Wednesday. We had 3 great weeks in France, but now he’s back at work. The day before he left, I asked him what he wanted to eat for lunch. My parents were going to babysit Quentin, so we had a lunch to ourselves. 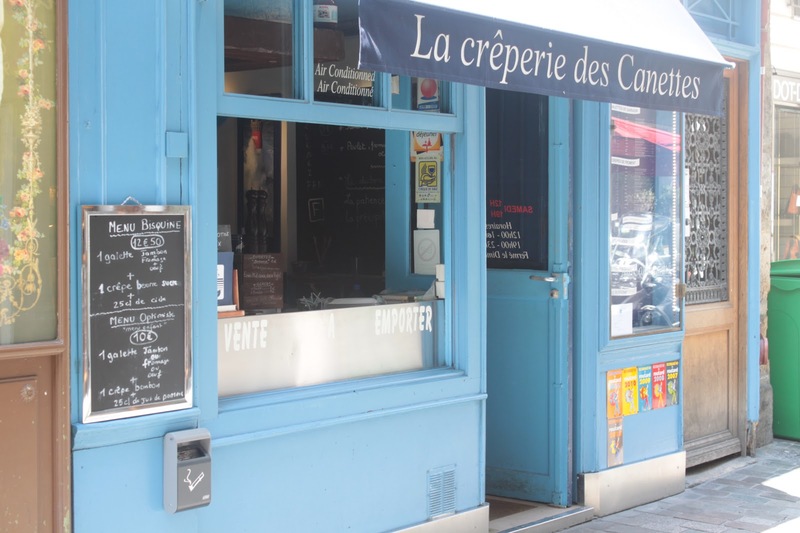 Trevor decided to go to our favorite creperie in Paris one last time- La creperie des Canettes. The name descriptively includes the street name, Rue des Canettes, so that you can never forget how to get there. The place is small and unassuming, although it’s clear that word has gotten around that they make great crepes, because it’s filled with both locals and tourists whenever we go. Part of the reason Trevor wanted to go back was that the last time we went on this trip, he ordered a non-traditional crepe, with tomatoes and olive oil and some other stuff that doesn’t usually go in a crepe. He was unimpressed and wanted to get a “real” crepe before leaving. In France, savory crepes always have ham, cheese or egg, or all of the above. Preferably all of the above. These are appropriately called “crepe complete,” and they are awesome. 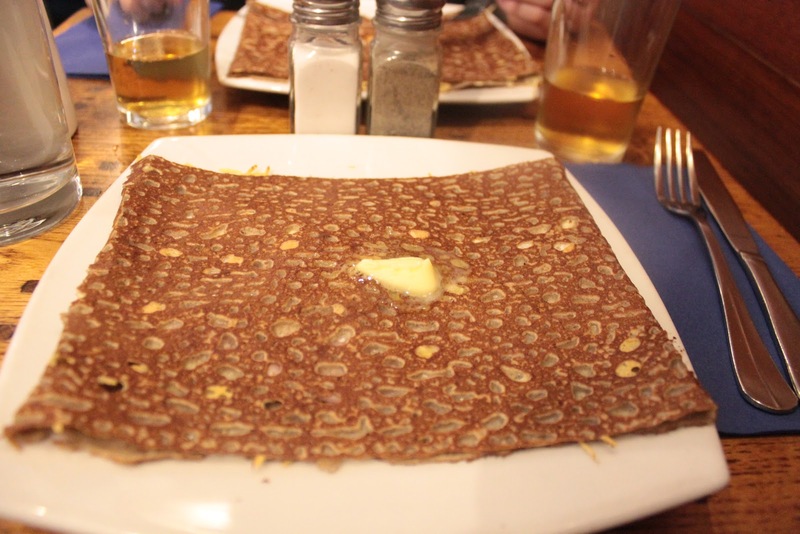 The crepe itself is always made with buckwheat flour when used for savory purposes. 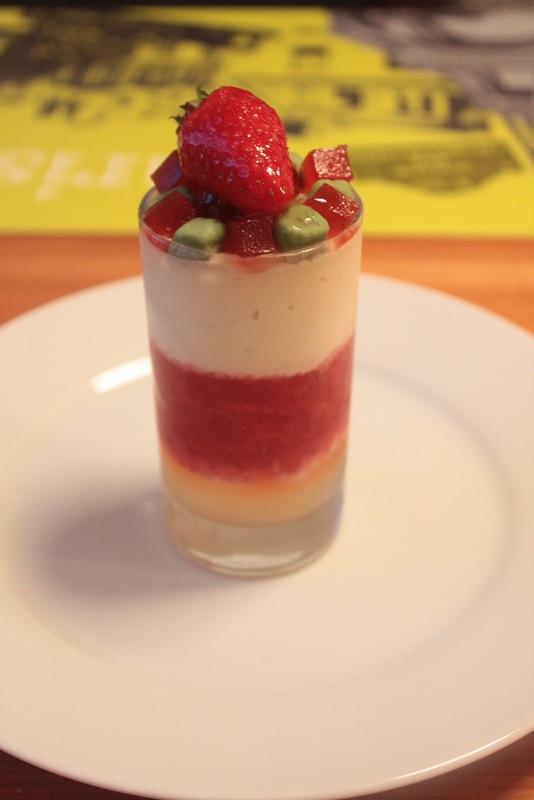 Normally I’m pretty shy about taking photos in a restaurant, but I decided to bite the bullet this time for the sake of my readers. Une crepe complete, with a pat of butter on top and hard apple cider to drink. 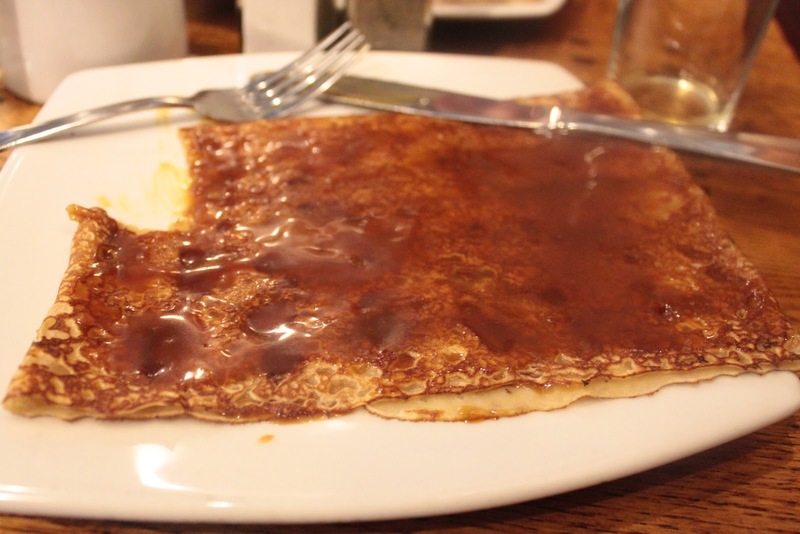 For dessert, I had what I always get at Creperie des Canetttes- a salted caramel crepe. They make their salted caramel in house and it.is.AMAZING. The picture doesn’t really do it justice, but here you go anyway. I am going to have to try to recreate this at home. Soon. So there you have it. If you’re ever in Paris, go to Creperie des Canettes. And really, don’t overthink crepes. They are best when they’re simple. Egg, cheese and ham. Enjoy! This entry was posted in french, restaurant review, vacation on June 1, 2012 by seedsowingmama.